For the first time since the six-year wrangle over short-term vacation rental regulations began in 2011, Flagler County government officials, on the defensive over likely changes to current legislation, held a joint public workshop with the local legislative delegation in Bunnell Monday focused exclusively on the subject. Flagler officials are hoping to convince Sen. Travis Hutson and Rep. Paul Renner, who represent Flagler, not to give in to likely proposals to scale back a 2014 law that gives Flagler and other local governments the authority to regulate their own rental industry, under home-rule authority. Flagler since 2014 pioneered the sort of ordinance other governments have adopted to regulate their short-term rentals. But the short-term rental industry has been trying since then to either scrap the law or emasculate it, returning the industry to the 2011 standard, when local governments were banned from regulating short-term rentals. The mere fact that the workshop was necessary is an indication of the county’s precarious position: changes to current law are more likely than not, and they’re likelier to go against Flagler’s existing regulations than not. The short-term rental industry was almost successful in the last legislative session. When it failed, it vowed to return come January. Flagler is not in the strongest position to defend its ordinance, if only because its own legislators have been preparing local officials for what they see as certain changes ahead. But he also cautioned that the new head count in the senate bodes ill for advocates of local regulation. Renner sees Flagler County as having struck the right balance between property rights and local regulation. But he said certain counties or cities are out of balance or violating state law, which gives “a lot of winds to the sails for full-on pre-emption,” meaning a state law that would revert back to the 2011 standard when local communities were forbidden from regulating the industry beyond what the state allowed, which was no regulation. Flagler officials put it simply: what’s in place now is what they’d like to protect. If their own legislators acknowledge that it’s the right balance, they see no reason to break that balance either way: they don’t want to further regulate the industry. Nor do they want to weaken existing regulations. To that end, County Administrator laid out a regulatory landscape framed by its legal realities and many myths that he says opponents of local regulations are throwing around. But those claims, he said, can be easily debunked–as he debunked them. “We’re frankly tired of dealing with it,” County Administrator Craig Coffey said at the end of his presentation, referring to the issue as a whole. It was not a joke: county officials in the last legislative session had to shuttle back and forth to Tallahassee with every hearing on the subject, straining resources and energy merely to defend what’s in place–what they say is working. Today’s workshop was another pre-emptive effort to defend those regulations. At times, however, whether because Hutson was playing devil’s advocate to the hilt or because he is less of an advocate for Flagler’s regulations than he makes it sound, it was as if Coffey and County Attorney Al Hadeed had to fight Hutson, or at least strain to convince him that Flagler’s existing regulations worked, rather than get assurance that he will fight on behalf of the county. One homeowner speaking during the public comment segment of the workshop, Roger Cullinane, took on Hutson’s seeming halfhearted defense of local regulations directly when he pointed out that earlier this year, Hutson had a chance, as chairman of a committee, could have stopped a proposed bill to scrap local regulations from being heard in his committee. Hutson chose not to do that. But Hutson then told the man that sitting on a bill would not have stopped it from going forward through other means. “What I did was not to slap anyone in the face, but it was actually to try to solve this issue,” Hutson said. Some 65 people, not including a dozen county staff members, filled the hearing room at the Emergency Operations Center in Bunnell. To correct the record, Coffey said the county ordinance does not regulate 80 percent of vacation rental homes, including owner-occupied homes, camps, condominiums (which are properly regulated), and of course long-term rentals. Frequency and duration are not regulated, in accordance with state law. Annual inspections look for smoke detectors, carbon monoxide detectors, pool alarms, exit lighting, fire extinguishers. Inspections also ensure that there’s at least one parking space per three occupants, one trash container for four occupants, and that there’s a contact person the county can reach whenever there’s an alleged violation. Violations are not equivalent to citations or shut-downs. The county asks managers or owners to fix the issue, and only if problems persist are actual fines issued. Persistent violations may lead to shut-down. In the first year after the ordinance went into effect some 80 percent of homes failed the first inspection. Now, hardly any fail inspection, and none do, among those who hold a county’s certificate–the equivalent of a license to operate a short-term rental. The rules apply to all. “We work with mom and pops to the corporate investor types,” Coffey said. The administrator then sought to debunk many claims about short-term rentals, including the generally false belief that state regulators inspect vacation homes, or that Flagler County is facing $22 million in property right claims from short-term rentals (it is not), a figure legislators earlier this year bandied about repeatedly during committee hearings. Hutson and County Attorney Al Hadeed had a pointed disagreement with Hutson over whether the state Department of Professional and Business Regulation does or does not inspect short-term rentals. Hutson claims it’s wrong to say the department outright does not inspect. Hadeed stressed that the department does not inspect single-family homes used for short-term rentals–not for safety, not for the standards the county does. The department only responds to certain consumer complaints. “They do inspect but it’s on a very limited basis,” Hutson said. “They do a very poor job of inspecting.” Hutson, who has been less amenable to local regulations of vacation rentals, was seeking to position the state as at least a potential regulator, if only it did a better job. Flagler officials feel the state would not have the capabilities–or the will–to do so. Paul Pershes, president of the Ocean Hammock Property Owners Association, said companies that manage rentals have little to no oversight. “We are managing their business and get nothing for it, and that is the problem,” he said, complaining of the absence of on-sight management. Homeowner associations are worried that coming legislation would also take away their authority to set rules–or to ban–short-term rentals. But she was followed by a woman who lives with her family in Hammock Dunes and helps her father manage Airbnb properties at European Village, which she said has helped the development toward recovery. “We’re helping people economize and at the same time ind you we are paying occupancy taxes,” she said. “Why can’t the little people be allowed to host,” she said. She was applauded as loudly by advocates of short-term rentals as were opponents, but from a different part of the room. 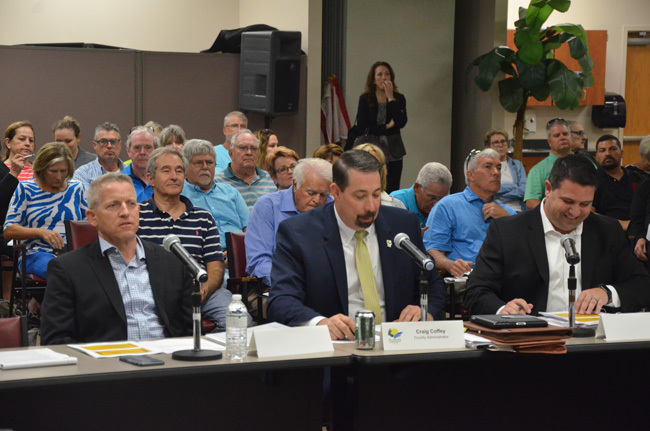 But none of what she said contradicted the county’s position: her short-term rentals are in Palm Coast, which is not in the county’s authority to regulate, and even if it were, Coffey said the condos would not be regulated anyway. “I hear a lot about property rights,” another property owner said. “What property rights are being held from owners of properties? A vacation rental is not a rental, it is a licensing agreement that a homeowner uses, just like a hotel, just like a motel, just like a bed and breakfast.” He said those types of businesses are zoned in commercial or tourist zones. Why, he said, should a vacation rental not be equally regulated? Yet another property owner, acknowledging that there’s no need to restrict property rights or the right to rent to vacationers, said it’s a matter of proper local management–and local ordinances that tailor regulation to local needs. We’re not against regulations, we’re not against making someone accountable for how they handle their property,” an Airbnb renter said. But, she said, the rules should apply to homeowners or standard renters equally. She pointed out that she has neighbors with dog that occasionally barks too much: she complains. And she pointed out that Airbnb has what amounts to a powerful self-policing tool: the reviews that renters leave online, and that can make or break a property owner. She said she’s had innumerable such reviews, but not a single negative one. A business owner in Flagler Beach provided a different sort of endorsement for Airbnb: it swells her business volume, and generates no complaints. Airbnb was the big winner of the workshop: host after host spoke of being in the Airbnb system, the additional income it provides, the alternatives it offers residents, the dearth of complaints it generates. They also made a necessary point: Airbnb rentals are not in the same category as the enormous family homes turned into vacation rentals, without a local property owner on site or nearby. In lieu to the standardization of processing sales taxes, licenses, zoning and audits, it is but proper to set limitations on these two industries – hotels and vacation rentals. We cannot just simply have a uniform rule for both entities since they are totally different.There may be laws/ordinances would be applicable to hotels but not to short term vacation rentals, or the other way. Somehow, illustration on the different regulations set forth for both entities must be identified since we are all looking its implications on economics and promoting safety and security to the general public. Please check http://rentalo.com to learn about vacation rentals. Not alot of my fiends stay living in one place for more than a month , it’s just how this new market, new economy, and younger generations are redefining the way we do things. Long term neighbors are a thing of the past. People need to accept and flow with this new way instead of fight it all the way. What a waste of tax payers time and money. The county is on the defensive because they want to control….it’s all about control. Do you not think there are now families displaced from the hurricane that will rent or buy homes for their families and extended families. Get over it and do something productive and let us property owners alone. We pay taxes and there were no regulations in place when we bought our homes, so don’t try to be slick now. Craig Coffey needs to be replaced….he likes to do back door wheeling and dealing and there would be no reason to if he was upfront and honest. What is he always hiding??? Renner and Hutson need to stay as far away from these poisonous politicians here in Flagler County if they want to retain their elected positions. We voters have already spoken in 2016 when we voted Hanns and Revels out….more is coming. It is time that Flagler County work on restoring their reputation and that elected officials remember who elected them and who they are to serve. Neither Hutson nor Renner cares a damn about Flagler County. Both care only about being Republicans in a Republican-run legislature. They will not fight for Flagler. They will not buck their Republican cohorts. They will fight only for their political careers. Dave seems to think living a transient life is the new norm . . . because that’s the way he and his friends choose to live or HAVE TO live. Transient living isn’t the norm for most people in society. Most people have regular jobs and don’t telecommute, which means they drive to and from a regular job every day which warrants a stable place to live . . . not a transient life. Dave: The new way is the old way . . . people with families prefer to have a stable home base for their children and their families. Your way, the transient way, doesn’t mean that’s the new norm. This workshop was a shame! Three minutes was not nearly enough time to make a case why home rule must be kept in place to regulate these transient public lodging businesses. But there was clear message sent by our representatives in Tallahassee. That they are more interested in protecting investors over their own constituents. This issue is much bigger than home sharing with the owner present in the residential dwelling. AIRBNB is a bad actor along with their counterparts Home-Away, VRBO, Florida Vacation Management Association. AIRBNB US revenue- 4.6 billion comes from whole -unit rentals( those rentals where the owner is not present durning the time of rental). AIRBNB has allowed the growth of “ illegal hotels” that are often unregulated properties operating in residential neighborhoods. Affordable housing advocates from Coast to Coast agree: AIRBNB in particular and the short term rental industry in general is facilitating a housing crisis by incentivizing property investors to convert homes and apartments into illegal hotels, thus decreasing the available housing stock and driving rent prices up. This is clearly no longer a Mom and pop housing activity- it’s become a profitable commercial enterprise. Even Representative Renner who likes to bring up private property rights can not separate a rental or lease unit from a transient public lodging establishment, AKA: Vacation Rental. A vacation rental is not a rental or lease. Look no further this is back up by the Florida Homestead Services. To determine the taxibility of various uses of real estate , you need to know the difference between a lease or rental of real estate and a license to use real estate. I believe that an owner has the right to rent or lease their home. But they do not have a right to operate a transient public lodging establishment business in a single family community. All other transient public lodging establishments are banned from operating in residential single family communities. A vacation rental uses a licensing agreement just like a hotel, motel or bed and breakfast. A license to use real estate merely grants a right to use the real property. It does not confer exclusive dominion or control over the property. Under a license to use real estate, the owner typically controls such things as lighting, heating,cleaning,repairing and opening and closing the premise. A rental or lease of real estate are not subject to Bed and Occupancy tax. However, income earned from providing a license to use real property are subject to tax. This clarifies that this operation is a business. I provided Representative Renner with this documentation. Let’s see what he does with it. It is my contention that all residents living in single family neighborhoods in our State without protection of local ordinances or local property zoning laws in place prior to 2011 when Senate Bill 883 was passed by the Florida Legislature had their private property rights taken away from them in favor of the Florida Vacation Management Association. Why should a municipality that had laws on the books prior to the enactment of Senate bill 883 in 2011 have different private property rights then municipalities that did not? If our legislature is going to preempt our local municipalities base on private property rights this must be done state wide. But this is not a private property issue at all. Property owners never had a right to operate a transient public lodging establishment business in single family communities until our legislature handed them the right in 2011 with the help of the Florida Vacation Management Association Lobbyist Lori Killinger. Representative Renner wanted to know the difference between laws that are applied to Bed and Breakfast dwellings vs vacation rental dwellings. Any single family home license as a bed and breakfast must abide by local property zoning, they must also be in compliance with fire, life safety codes prior to operating ,they are also inspected by the state bi annual for fire and life safety codes and in most cases they required sprinklers. This is not a complete list of requirements. But the biggest difference is that these dwellings are no longer referred to as homes. There certificate of Occupancy now reflects its new use. Why are vacation rentals still referred to as homes? Both these dwellings are transient public lodging establishment businesses. There was a reason why the Florida Vacation Management Association included a name change in the 2011 Senate bill. These vacation rentals where called Resort Dwellings prior to this law. There certificate of occupancy should reflect their new use just like the single family home converted to a B & B. But a single family home license as a vacation rental does not have to be in compliance with the additional Florida fire prevention codes prior to operating. Over 80 percent of these dwellings have been operating in non compliance with the Florida fire prevention codes for years in Flagler County prior to the adoptions of our ordinance. In fact a NY Times article quoted AIRBNB stating that CO and Smoke detectors where not required in these dwellings. In addition the state exempt vacation rentals from inspections completely when they passed 2011 Senate Bill 883. This bill also prevented our local municipalities from using their local property zoning laws that protect our neighborhoods from incompatible uses. Local property zoning laws applies to all transient public lodging businesses except vacation rentals. Why? If it was up to Senator Hutson he would regulate all homes to the same standards as vacation rentals.But we do not operate a transient business. Our homes have an occupancy permanent in nature. Our homes are not required to abide by additional fire prevention codes. We do not advertise our homes on short term vacation rental internet sites. We do not charge occupants to stay overnight in our homes. We do not have check in or check out times. We do not provide maid service. We do not pay hotel or occupancy taxes. We do not license our homes as a transient public lodging establishment. We do not apply for a business license from the state. What lodgic is our Senator using? He along with his counterparts in the legislature are out of touch with his constituents. Senator Steube last years bill sponsor to remove home rule from local municipalities claimed that 93 percent of Florida residents where in favor of vacation rentals. But what he left out was the question that was ask during the survey. The Mason Dixon survey commissioned by Home- Away. The question was phased like this: Do you believe travelers should or should not be permitted to rent accommodations other than hotels- such as vacation rentals and bed and breakfast during there visit to Florida? What the Senator left out was the nuance such as if it was located in communities zoned for only single family or if it was in your community zoned as single family. So I decided to conduct a survey of my own. I ask our Florida residents if they would live or buy a home nextdoor to a vacation rental? 95 percent said No! After the meeting I approach Senator Hutson requesting a meeting. He stated that we have had a discussion already on this subject two years ago. I also stated the only way to solved these issues was to introduce a bill to repeal the 2011 Senate bill that removed home rule from our local municipalities, removed our local property zoning, change the name of these dwellings from Resort Dwellings to vacation rentals, eliminate from the inspection requirements that all other transient public lodging establishments must abide to, removed the requirement of sprinklers and appointed a representative from the Florida Vacation Management Association to the board that is supopose to monitor these dwellings. But he refused to introduce a bill to repeal the 2011 law. Stating that it will not be supported by his fellow Republicans or Democrats. What our legislature does not realize that general revenue from sales tax collections the largest percentage comes from our residents the ones who elect our legislature at 61 percent followed by businesses at 26.6 percent than tourist at 12.5 percent. I am asking our residents to get involved before it is to late. The turn out for this meeting was a complete failure. Before you know it you will be living right next door to a transient public lodging establishment. With the advent of AirBNB, VRBO, Vacation Rental Pros, etc. The short term, “holiday rental” industry is BOOMING world wide! Keeping such a massive industry completely “unregulated” is completely irresponsible at best! Zoning and safety considerations MUST be considered! Yes, there are rights on both sides. Think of it this way. . . what if someone wanted to turn their single family home, in a zoned residential area, into a restaurant? There would be regulations for sure. What about a bed and breakfast? Wouldn’t there be regulations? What, precisely, is the difference between a short termed rental and a hotel that has suites where people could stay for months? Strict regulations MUST be addressed and implemented. . . preferably at the state level, if not. . . then locally! The lobbyists are lining pockets to keep the regulation of this multi-million dollar industry from being regulated on any level! There will need to be more regulation of vacation rentals in the near future because it is starting to affect the availability of affordable housing. Everywhere, landlords are getting in on the bonanza of converting their properties from traditional leases to vacation rentals. It’s their property so they should be able to turn it into a vacation rental if they please, but government has a responsibility to incentivize traditional leases by making vacation rentals not such a bonanza. It’s nice that you own multiple properties and can just wait for money to be deposited into your accounts, and it’s nice for vacationers to be able to travel from AirBNB to AirBNB, but let’s think about social responsibility and our fellow citizens who need a normal home.